« Airwave Radio: what is it, what does it do and Who is it for? 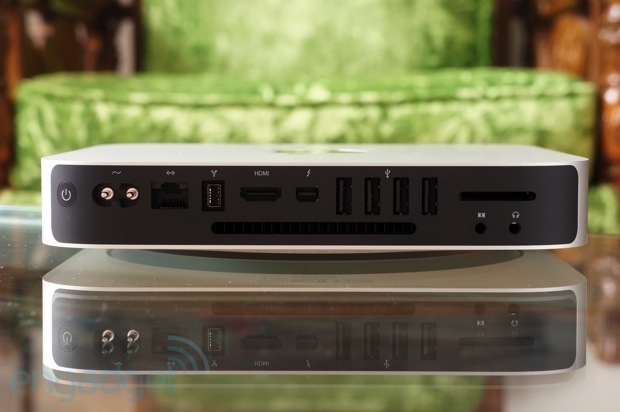 Editors Note – Smaller, lighter media player computers always get our attention, and the new mac mini is an invention that will satisfy the MAC faithful and entice the window lot. With an i7 inside and 4gb of RAM you can really get the company’s jack-of-all-trades computer for your living room. October 23rd was mostly the iPad mini’s coming out party; an event with one major headliner. But that newborn product didn’t enterApple’s ecosystem alone. Amidst the flurry of announcements, there was one other wee hardware relative on hand ready to join in on the launch festivities: a refreshed 2012 Mac mini. Addressing criticisms oflast year’s model, Apple added USB 3.0 ports, upgraded to third-generation Ivy Bridge Core processors and boosted the standard RAM allotment to 4GB (you can configure it with up to 16 gigs). Perhaps most interestingly, it’s now offering a hybrid storage option, the so-called FusionDrive, which combines flash memory with a SATA HDD. One quirk still remains, though: the product’s demographic leanings. 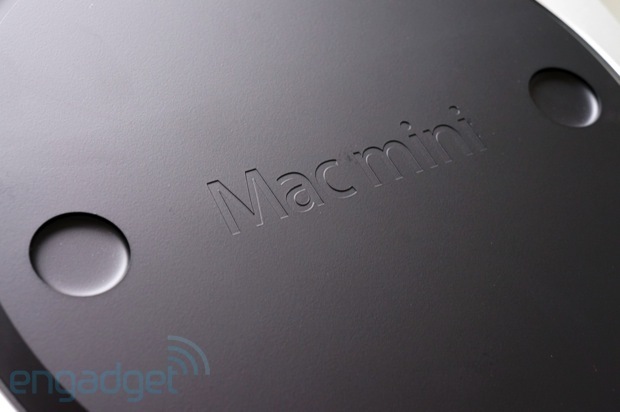 Just who is the Mac mini for? Is it the go-anywhere, portable desktop best integrated in yachts, airports, automobiles and living rooms? Or, with a starting price of $599, is it the perfect, low-cost migration assistant (pun intended) for consumers making the switch from a Windows desktop? Follow on to see which hat this not-quite-an-HTPC wears best. Boiled down to its essence, the mini’s brushed aluminum enclosure has a wallflower appeal that’s at home in a variety of settings; a dash of modernism that should work in many environments. Much of this is due to the unit’s diminutive dimensions, which remain unchanged since the mini was redesigned back in 2010. At 7.7 x 7.7 x 1.4 inches, it retains the basic square shape of its two predecessors. It eschews hard angles for softly curved corners, enlivened by the occasional black accent (e.g., the logo on top, the strip around back housing the ports and the removable lid at the base). Users interested in purchasing the optional Apple remote for home entertainment purposes will be glad to know this unit still features an IR receiver. For what’s it’s worth, you can flip the device on its side should you be faced with space restrictions and need to squeeze it in amongst other office or A/V equipment, but it probably won’t look as nice with its circular lid showing. 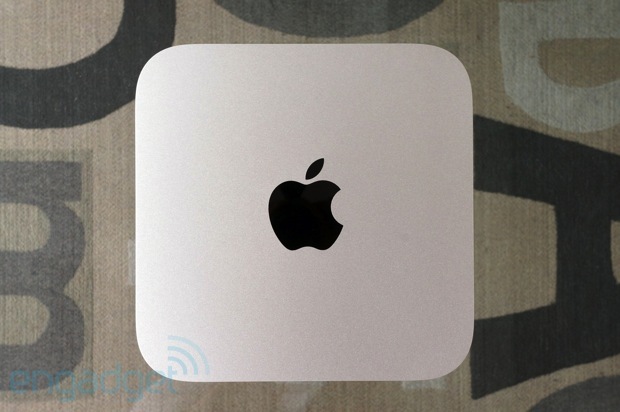 As much as things change, they seem to stay the same, and that’s quite true of this Mac mini refresh. Though a quick glance at its back panel might mislead consumers into believing it’s business as usual, there’s actually a very significant change at play here — namely, the addition of high-speed USB 3.0. Otherwise, the ports read from left to right exactly as they did on the 2011 model: power (still integrated), Gigabit Ethernet, FireWire 800, full-sized HDMI, Thunderbolt, 4 x USB 3.0, SDXC slot, audio-in and a 3.5mm headphone jack. Last year, we criticized the company for not including a Thunderbolt dongle in the box, but that critique apparently fell on deaf ears. Instead, we again received the lone HDMI to DVI adapter and that, folks, is just history repeating itself. 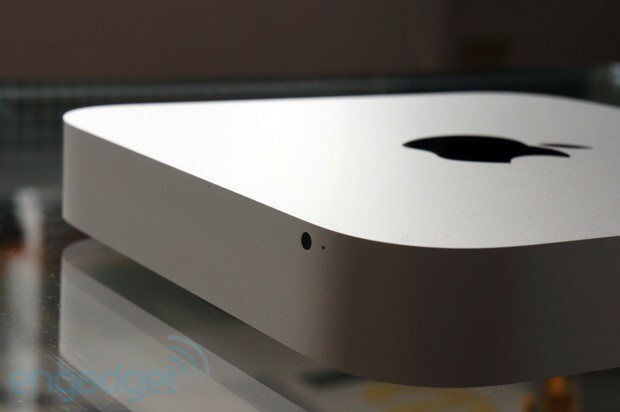 Similarly, Apple remains unmoved in its determination to make just one aspect of the Mac mini swappable, and that would be the unit’s expandable memory. Despite the obvious pitfalls associated with HDDs (i.e., the likelihood of potential hardware failure and the like), users that pry open the device’s bottom lid will only have access to the two SODIMM slots. The rest is inaccessible (unless you’re the DIY type, in which case, have at it!). However, should you require monstrous amounts of RAM, the mini now supports up to 16GB — so, there’s that to smile about. Other than that, this compartment also houses the WiFi radio (AirPort Extreme 802.11n), Bluetooth 4.0 antennas and the cooling fan. Making the leap from last year’s Sandy Bridge processors, the 2012 Mac mini now runs on Intel’s third-generation Ivy Bridge Core i5 and i7 CPUs. Our $799 review unit packs a a quad-core i7 clocked at 2.3GHz along with an (optional) 1TB FusionDrive and Intel HD 4000 graphics and 4GB RAM. Consumers with more basic computing needs can opt for the base unit with a dual-core i5 CPU and a 500GB hard drive. This features the same clock speed, graphics solution and memory allotment, but for a lower price of $599. There’s also a $999 server option geared towards enterprise and power users, which is similar to the high-end consumer model but has dual 1TB SATA drives. Since the model Apple shipped us for review is designated as the top-end consumer configuration — what with its quad-core core i7 and hybrid FusionDrive — we decided to stress it to the utmost and use it as our daily workstation. From a cold boot off the SSD, it took the system 12 seconds to reach the startup screen, which is on par with the MacBook Air (last year’s Sandy Bridge model, even). The mini ships withOS X Mountain Lion pre-installed, as well as the iLife suite, and indeed, that quad-core CPU is more than enough to handle simple OS actions with aplomb. What we were more keen to test out was its stamina when stressed with an Engadget editor’s daily workload. On any given day, we keep roughly 10 applications running at all times (e.g.,Photoshop, Tweetdeck, Skitch, Spotify, Evernote and an IRC client, among others), in addition to multiple tabs open within two separate browsers (i.e., Firefox and Chrome). Our jobs depend on this level of multitasking and we’re pleased to say that the mini managed that processor strain with a graceful silence. In all instances but one, the unit remained relatively cool to the touch and surprisingly quiet. The only time we ever heard a peep from was when we added Steam and Blizzard game downloads to the active processes load. Even then, the sound of the whirring fan barely registered above a whisper. On the gaming front, it should go without saying that Macs aren’t necessarily the go-to platform for the latest and greatest studio efforts. Indeed, we’ve noticed incompatibility with most newer titles thanks to Apple’s choice of graphics chip, but for the sake of this review we fired up Diablo III to get a sense of how the Intel HD 4000 GPU fares. With every quality option set to high (Texture, Physics, Shadow, etc. ), resolution at 1,280 x 1,024 and fps at 60, we didn’t encounter any slowdown or drops in the frame rate. Note, we didn’t have the time to engage clusters of baddies (about 50 to 60 onscreen at a time) to truly tap out the system, but with more than a dozen characters onscreen, we observed a frame rate that peaked around 42 fps. Note: higher scores are better. Benchmark testing backed up our anecdotal assessment: the machine nearly doubles the 2011 model’s scores. As you can see in the table above, it yielded average overall Xbench scores of 454, with an average CPU score of 270 and an average thread score of 1,418. In Geekbench, meanwhile, it delivered a result of 10,748. Don’t call it an HTPC. Not because we disagree with that moniker, but because Apple vehemently denies its applicability here. And, because it still lacks an optical drive (and you know how we feel about that). Yet, regardless of what Apple says, we can’t shake the feeling that this little box will inevitably make its way into users’ living rooms at some point in its life cycle — it was born this way, people. In fact, this editor couldn’t resist the urge to take the mini chez lui and hook it up to a palm-sized 3M projector. Using the easily accessible HDMI port, we had no trouble connecting the device to the projector, and mirroring the contents of our external Thunderbolt display. Mind you, that included 1080p films and TV shows, but also streamed content from Hulu, Netflix and YouTube. We did, however, encounter Bluetooth audio sync issues with our Jambox, forcing us to depend on the mini’s able, but far-from-powerful internal speaker. Of course, you can always go the more traditional route and attach it to your HDTV, but if you’re aching to make use of that vast DVD library (sorry, Blu-ray owners), then prepare to spring for a SuperDrive. At that point, though, you may as well just enter the MacBook fray. Then again, if a media focus is your bent, you could also go the Apple TV route for a more palatable $99. Apple’s quite pleased with the mini’s newest feature, the FusionDrive, even though hybrid storage solutions have been in use for quite some time now. So, what is it exactly? Buzzy marketing term aside, this setup pairs 128GB of flash storage with 1TB of traditional HDD storage. It works like this: from the moment you take it out of the box and start it up, your Mac mini will boot, run and store files using this volume, lending every action that surface speediness. 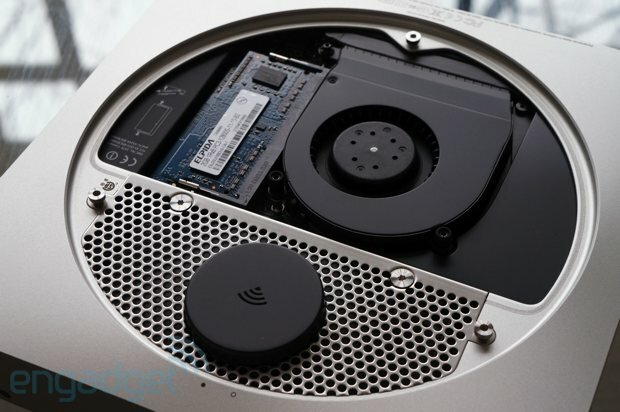 But as time progresses and your storage begins to spill past the SSD’s 128GB limit, the FusionDrive kicks in, analyzing user-level actions based on algorithms to determine commonly used files and then allocating them accordingly. Say, for example, you’re a photo editor who makes heavy use of Aperture, but rarely bothers with iPhoto. Well, over time, the system will acknowledge this usage pattern and relegate iPhoto to the hard disk’s slower volume, so Aperture will continue to launch and run quickly from flash. What’s more, all of this is done behind-the-scenes when the mini is idle, so users won’t notice any changes taking place. In fact, there’s no real way to monitor or edit how the system arranges the storage — it’s made to appear as one unified volume. 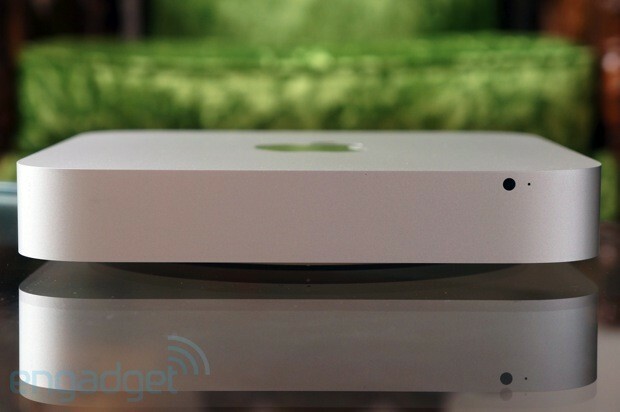 It’s fair to say the Mac mini occupies a special place on the consumer spectrum. Consider it a 3 on our appropriated Kinsey scale of tech-to-consumer affiliations. It’s the perfect bridge to all things Apple. Designed, initially, to help make Windows users feel at home within the Mac ecosystem, the mini was offered up as an elegant solution — a compact desktop that would play nice with people’s existing peripherals. But as time wore on, this “appliance Mac” (as one rep put it) took on other uses in enterprise and among power users. Eventually, it wormed its way into all manner of server-based applications: digital signage, airport arrival displays and so on. The mini could also charm fairly frugal shoppers, though, packing a quad-core Intel Core i7 into the top-end $799 model. Whether you really need the added boost of the 1.12TB FusionDrive depends entirely on your consumption habits, as you can always opt for a perfectly capacious 256GB SSD and call it a day. In fact, that latter option might be more than enough for most. So, where’s the rub? Well, that’s just it. If you fit the sort of user profile we’ve been describing, we aren’t quite sure there is one. At the end of the day, the mini is destined to sit outside of Apple’s public limelight like all the models that have come before it. It’s the company’s jack-of-all-trades, but a shining star for those in the know.